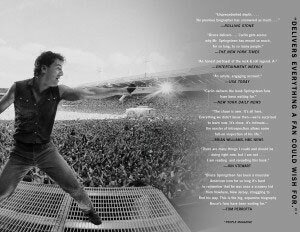 The softcover edition of Peter Ames Carlin's best-selling Springsteen biography is published in September 2013, the book opening to reveal a cool photo spread on the inner front cover (right). This sweeping biography of one of America's greatest musicians is the first in 25 years to be written with the cooperation of Bruce Springsteen himself. With unfettered access to the artist, his family, and band members -- including Clarence Clemons in his last major interview -- acclaimed music writer Peter Ames Carlin presents a startlingly intimate and vivid portrait of a rock icon. Built from years of research and unparalleled access to its subject and his inner circle, Bruce presents the most revealing account yet of a man laden with family tragedy, a tremendous dedication to his artistry, and an all-consuming passion for fame and influence. With this book, the E Street Band members finally bare their feelings about their abrupt dismissal in 1989, and how Springsteen's ambivalence nearly capsized their 1999 reunion. Carlin deftly traces Springsteen's often harrowing personal life: from his lower working-class childhood in Freehold, New Jersey, through his stubborn climb to fame and tangled romantic life, and finally to his quest to conquer the demons that nearly destroyed his father. In Bruce, Carlin encompasses the breadth of Springsteen's astonishing career and explores the inner workings of a man who managed to redefine generations of music. 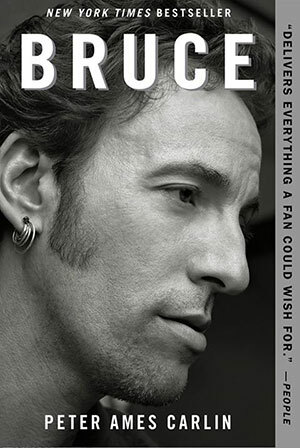 A must for fans, Bruce is a meticulously researched, compulsively readable biography of one of the most complex and fascinating artists in American music. Touchstone/Simon & Schuster, softcover, 512 pages.